This adorable ensemble is not terribly difficult to find. The green felt holds up fairly well and is usually in very good condition. The black and white checked tights and cap are usually the hardest pieces to find. 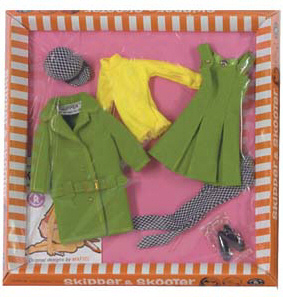 Leave Vintage Skipper Town Togs, Return to Vintage Skipper Dolls Main Page.